Venture into the heart of Yellowstone on a journey through the park’s winter wilderness. Beginning at Mammoth Hot Springs, you’ll travel by snowcoach to a warm and cozy base deep in the center of the park at Old Faithful Snow Lodge. 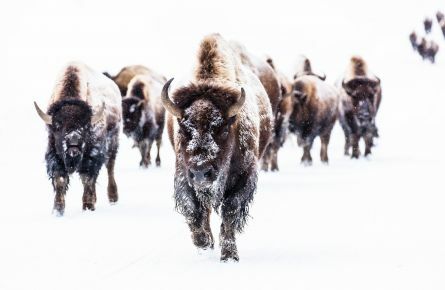 From there you will travel by snowcoach to Yellowstone’s remote and spectacular winter gems – including Grand Canyon of the Yellowstone – in search of wildlife, steaming thermal features, grand winter views and the true sense of winter wilderness. This program is primarily snowcoach based, with short easy walks on foot or snowshoe to viewpoints and thermal areas. View the itinerary. Activity Level – Hiking or snowshoeing on snow-packed trails, up to 3 miles per day with climbs up to 250 feet. *Rates do not include taxes, fees and gratuity. Package prices higher during Christmas Holiday (12/22-1/4). Minimum age of 12 years old. Minimum of 4 persons required for course to occur. Package is available Sundays starting December 22, 2019, with last session February 23, 2020. Get the most out of your visit during the magical season by following these guidelines. 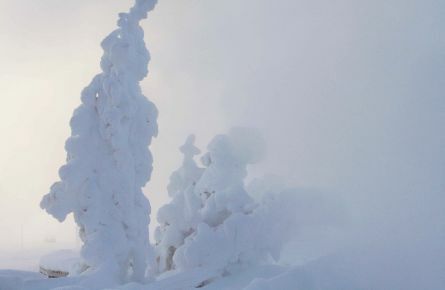 When Yellowstone National Park is covered in a blanket of snow, things can get a little weird. 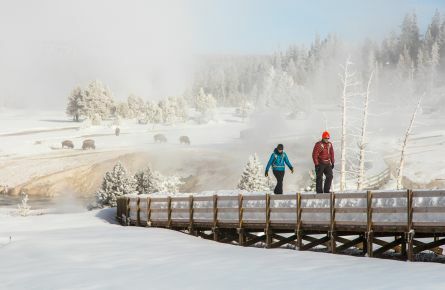 In winter, Yellowstone National Park morphs into a picturesque wonderland, complete with snowy woods, ice pellets of geyser rain, frozen waterfalls, and abundant animals.